We're having Vacation Bible School August 17-21st, from 9am -12 each morning. All ages are invited to have fun together with Bible stories, songs, Scripture memorization,crafts, games and snacks. If you're reading this and would like to register or get more info, email us at peninsulabaptist@gmail, or call 503-708-8980. Come to our free Summer Music Festival! Summer choir is starting at Peninsula Baptist church. 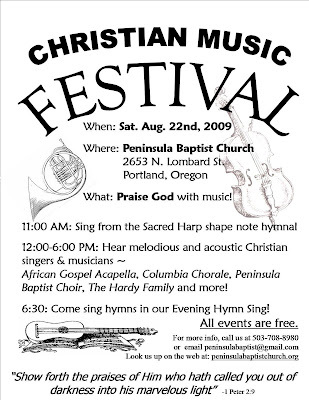 We will be meeting at 6:00 pm on Wednesdays through August 19th, and will sing at the Christian Music Festival on Saturday, August 22nd. All ages are welcome to come sing with us! There is now a new website! Please visit us at peninsulabaptistchurch.org!